By Uwe M. Borghoff, Peter Rödig, Jan Scheffczyk et al. Key to our culture is that we can disseminate information, and then maintain and access it over time. 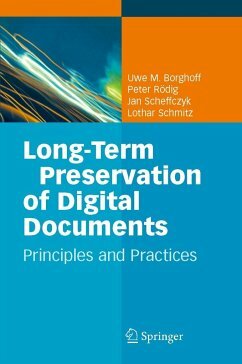 While we are rapidly advancing from vulnerable physical solutions to superior, digital media, preserving and using data over the long term involves complicated research challenges and organization efforts.Uwe Borghoff and his coauthors address the problem of storing, reading, and using digital data for periods longer than 50 years. They briefly describe several markup and document description languages like TIFF, PDF, HTML, and XML, explain the most important techniques such as migration and emulation, and present the OAIS (Open Archival Information System) Reference Model. To complement this background information on the technology issues the authors present the most relevant international preservation projects, such as the Dublin Core Metadata Initiative, and experiences from sample projects run by the Cornell University Library and the National Library of the Netherlands. A rated survey list of available systems and tools completes the book.With this broad overview, the authors address librarians who preserve our digital heritage, computer scientists who develop technologies that access data, and information managers engaged with the social and methodological requirements of long-term information access. Uwe Borghoff is a full professor of computer science at the University of the Armed Forces (UniBwM), Munich, Germany. Prior to this, he worked at Xerox Research Centre Europe in Grenoble, France, where he led the coordination technologies group. Peter Rödig (UniBwM) is developing methods for long-term preservation of digital data. Related research interests include document engineering and database technologies. Jan Scheffczyk (UniBwM) is researching issues such as consistency maintenance in document engineering, long-term preservation of digital data, and software engineering. Lothar Schmitz is a lecturer at the UniBwM, and his research interests include software engineering and long-term preservation of digital data.